This entry was posted in demolition, The Loop. Bookmark the permalink. The façade is being left in place, but the rest of the building is going down. Spokespeople for the owners confirmed that the tiki sign will be going away, too – not that I can find the place where I saw that quote at the moment. 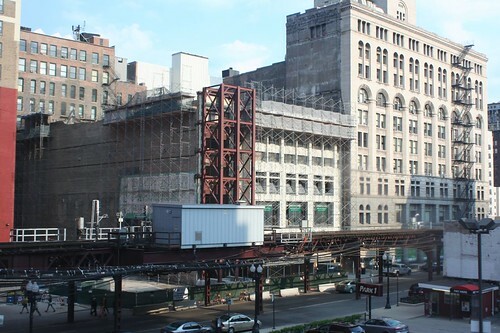 http://www.roosevelt.edu/Home/Wabash.asphttp://forum.skyscraperpage.com/showthread.php?t=179654http://chicagoismynewblog.files.wordpress.com/2009/05/roosevelt.jpgHow can you say it's unlikely to be an improvement? It's replacing a parking lot and the dreadful Herman Crown Center. The facade was the only significant part of the Annex, and the floor plates were too small to be functional. Remember that the building was primarily built as a heating plant, with some incidental artists studios – we're not talking significant structure or interiors here. The incorporation of the facade into the new structure is respectful, and the new structure complements the Auditorium and Fine Arts Buildings better than the Crown Center did. I think this is about the best facadectomy possible. BW – fair enough. As I recall, I wrote the angry parts before realizing they were preserving the facade in place. I am pleased that they are keeping the first bay in place. Whoa, whoa, Editor, you're way out of line. I agree that the Herman Crown Center was no loss, but generally speaking, buildings that CAN be reused SHOULD be. Herman Crown wasn't reusable, and I don't think that Mr. Powers was even addressing Herman Crown – the Fine Arts Annex is in question here. (The parking lot you speak of is not in fact part of this project, for that matter.) With regard to useable buildings being demolished – I reiterate, Herman Crown probably wasn't, and especially with the relationship to the Auditorium it should have been removed – it is rather wasteful to send all that construction material, embodied energy, and square footage to a landfill. This may have been an exception. But to set up a false dichotomy and suggest that a call for preservation is tantamount to calling for fiery death? That is truly low and self-righteous. 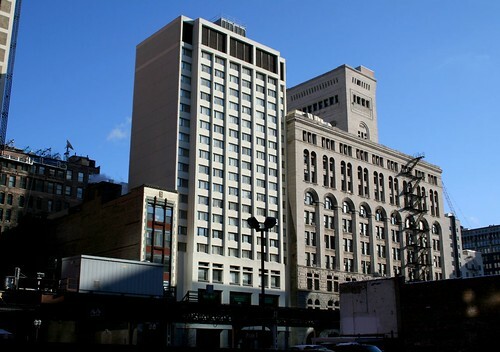 As for "Should Roosevelt University spend extra money to preserve a crumbling building and a surface parking lot, or put the difference into educating its students?" Another false dichotomy. Roosevelt is spending extra to make a new building with quality architecture. They could have gone cheap. You know architecture is more than enclosed space.Also, how can you possibly review a building that hasn't been built yet? Your review sounds like the building is up and running when it hasn't even been started yet. That's just intellectually dishonest. Why do you assume that the demolition materials are going to a landfill? According to what I've seen and read, in most demolitions of older building 80-90% of the material is recycled. I don't have any specific insight into this building's construction process. I suspect you don't, either.As for what is written on CAI, it's an evergreen piece and will be updated as events warrant and as time allows. With almost 5,000 building articles covering 200 cities around the world across a dozen web sites, it is not possible to update each individual building's web page hour by hour. Wait, wait… you're an architectural writer, and yet you seriously just pulled out the ol' "It's not being built with YOUR money, so you can't have an opinion on it" card? Seriously? ?Anyways, my main concern is being addressed; the facade and first bay are being left in place. That's… pretty good. Not ideal, but pretty good.Where did I say anything about a parking lot?? I don't recall stating that you can't have an opinion about the building. My objection is that you called it dumb and wasteful without any corroborating evidence. I still don't see how tearing the old building down is wasteful, especially considering that the rehab cost would exceed the value of the building. Well, it's right there in your first comment.. but this could quickly drag us both down the road of Dumb Internet Arguments, so let's turn around.My blog comments are generally off-the-cuff and at present are freshly tainted by the Michael Reese experience. I saw a cool building getting ready for knockdown, so I ranted about it for five seconds. I did not research (well, not very deeply, anyway), I just snapped a couple of shots while passing on the El. Someone pointed out the plans for the building, and I changed my mind, also right there in the comments. (Twice.) End of story. Agreed. Let's not let this page degenerate into the kind of invective that tends to show up in the comments sections of newspaper articles. There's enough anger on the internet already. Noah Vaughn's photo at http://www.flickr.com/photos/nvaughn/4719295255/ shows that only the facade was kept, not the first bay.